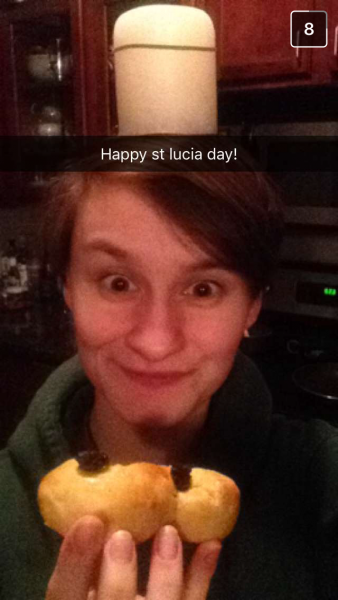 Happy St. Lucia Day to you all from Fiona! Snapchat just received. At first I couldn't figure out WHAT was on her head. And then I realized: it's probably the only candle in her apartment. Love and lussekatter to you all. 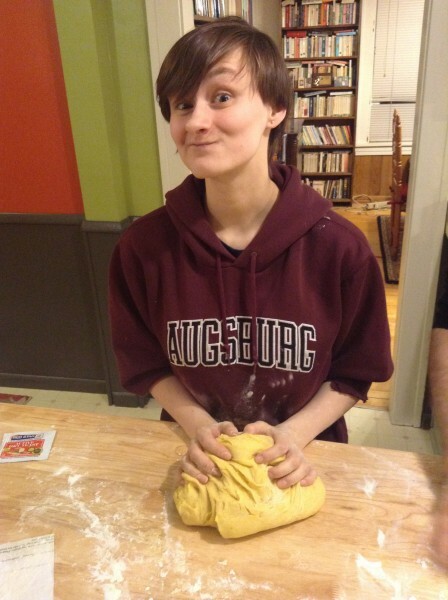 Fiona was over last night to make the Lussekatter! We also put up our new (artificial) Christmas tree, which looks lovely. The Lussekatter is ready for tomorrow! Fiona came by tonight with a couple of her friends to prepare the lussekatter for tomorrow morning. She won't be here tomorrow morning with a candle crown to serve, but I'll have the lussekatter with cocoa for my breakfast. And she's bringing home saffron-scented buns to give to her friends. 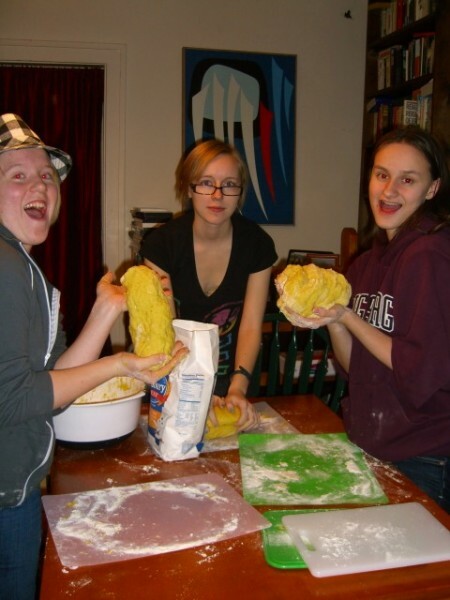 Fiona made a quick trip home with her friend Hayley to prepare for St. Lucia Day tomorrow. I drove the two of them back to school afterwards, loaded down with more lussekatter rolls to give her friends tomorrow. I'll miss my girl. But there will still be saffron-scented lussekatter for us in the morning. All is right in the world, and she's where she needs to be. Happy St. Lucia Day from Fiona and Delia! This is why I wanted to get home so badly last night. 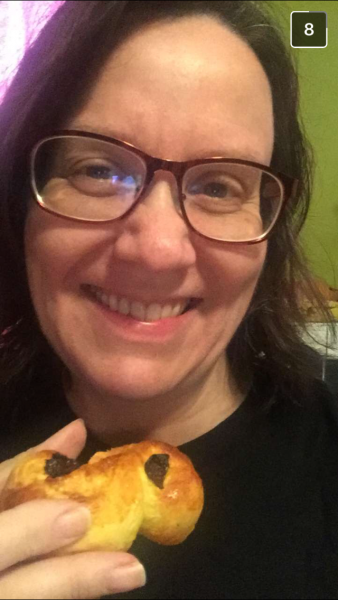 Knowing that St. Lucia's Day was coming up, and armed with mrissa's recipe for traditional lussekatter (see her post about making it, here), I sallied forth to Lunds and purchased some saffron. Man, saffron is expensive. I gave it to Fiona, along with the recipe, and said, "well, if you'd like to try making it, here you go." I wasn't sure she would. The kitchen isn't ordinarily a place of great delight for Fiona, unlike Delia. 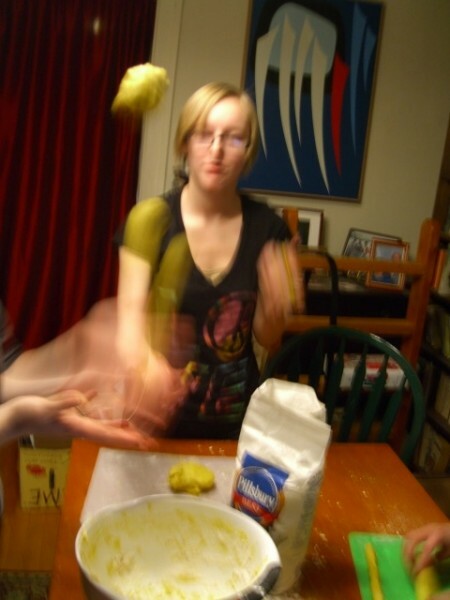 When we came home from the theater last night, they told me that Delia'd been making truffles, but I neither saw nor smelled any sign that they'd been making lussekatter. "Sorry the kitchen doesn't smell very good," Delia said. "I'm afraid we burned a bag of popcorn." Crafty girls. They burned the popcorn on purpose, to cover up the smell of the lussekatter, and then they hid it in the photo cabinet when it was out of the oven. At 6:30 this morning, they appeared at our bedside, Fiona a vision of the saint in white chemise belted with the red sash, and with a crown of candles, holding the tray of lussekatter, and Delia carrying the cocoa. "Happy St. Lucia Day!" So we had a sleepy and happy breakfast together. 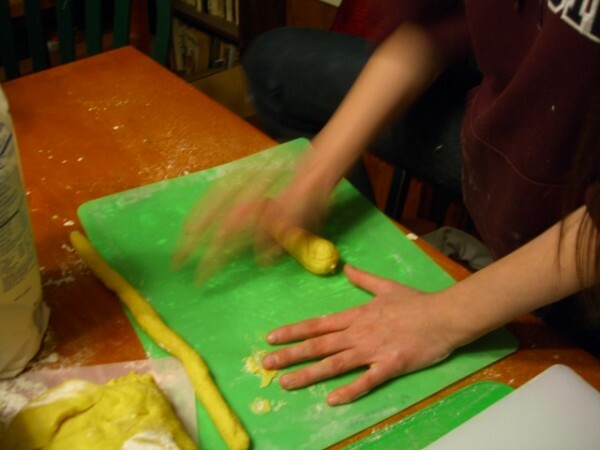 "Did you enjoy making the lussekatter?" 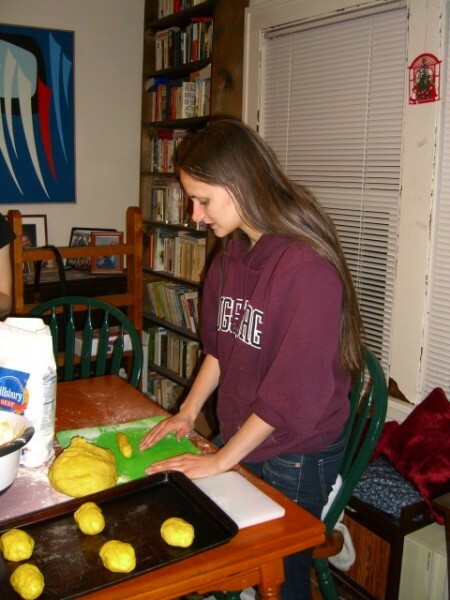 "Oh, it was SO much fun, especially the kneading part." The results were well worth it. The lussekatter was delicious (even if Fiona skipped the traditional raisins because she hates them). Yes. The Christmas season has begun. Light is there, even in the darkest days. You can click on the "st. lucia day" tag to see my posts and pictures from previous years. In the pre-dawn stillness of my bedroom this morning. "I was planning on serving the chocolate chip English muffins but somebody ate them all." "I'd meant to stop at a kitchen speciality store, to get some saffron so you could make proper St. Lucia lussekatter bread. But I have to admit, gingerbread cookies make a nice substitute." "Hey, don't jiggle the bed. You'll spill the cocoa." "There'd better not be any cocoa on my bed." "It's all right. It just landed on the bathrobe. You can wash it out." "I just washed that bathrobe two days ago." "Hey, don't fall back asleep, Daddy." "Just think, people all over the world are doing this." "Well, quite a few in Minnesota. We have a lot of Swedish people here." I looked around at the little circle of light cast by the (battery-operated) candles of the St. Lucia crown, which Fiona had removed and placed over the cookies plate. Fiona lay curled on her side, in her white chemise with the red sash. Delia lay next to me, snuggled in her bathrobe. Rob was propped up on one elbow, cradling his cup of cocoa, with his eyes at half-mast. The mock candlelight sculpted their features gently, casting a beautiful glow over all their sleepy faces. "This is what family is all about," I said softly.